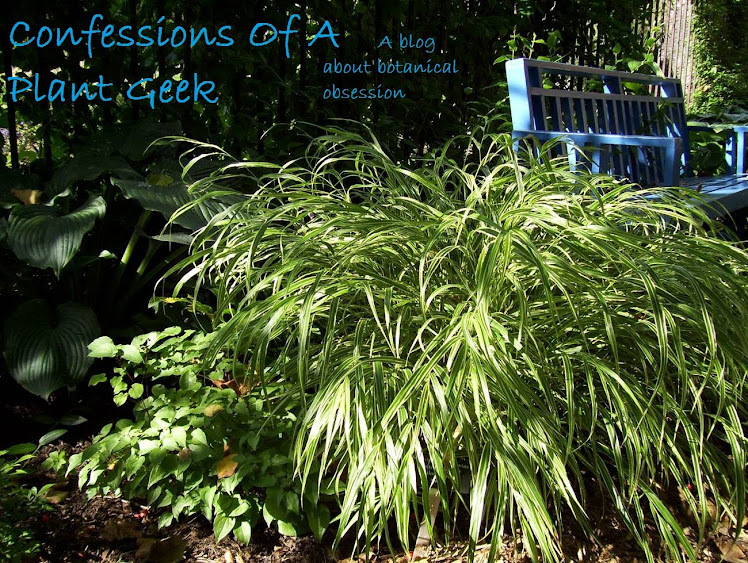 Confessions Of A Plant Geek: New and Improved! 2011 promises to be another year of great new varieties. We've got a bunch of great new ones for you to drool over, here are some highlights. Achillea Seduction series. I'm not a big fan of Yarrow. They flop, self-seed like crazy, or just look plain ugly after blooming. The Seduction series fixes all of those things. They are sturdy, stay in a fairly well behaved clump, and rebloom very well with dead-heading. They aren't exactly new, we've been carrying Strawberry Seduction for 3 years now and I love it. We're adding Peachy Seduction this year, and should also have Sunny Seduction. Actaea pachypoda 'Misty Blue' I am a big fan of native plants. This selection of white baneberry features bluish foliage as well as white flowers followed by white berries. Great for the shaded or woodland garden, this selection will get 2-3' tall and wide and makes a terrific background for hostas, ferns, and grasses. Agastache 'Summer Sunset' Another great hyssop from Terra Nova. Pretty much all of their Agastache are being sold as zone 6 hardy, and I've found with good drainage they've all survived here quite well. This beautiful orange flowered variety should be no exception. Dicentra spectablis 'Valentine' Everyone has wanted a red-flowered bleeding heart for a long time now. It is finally here. This is the reddest to date, and it is fantastic. The number of Echinacea varieties continues to expand exponentially. This year we have: 'Aloha' - a new soft yellow single, 'Cranberry Cupcake' - a shorter bright pink double, 'Daydream' - a strong yellow single, 'Irresistable' - a great double coral, 'Jupiter' - another addition to the big sky series this one is soft coral peach, 'Mama Mia' - a salmon orange fading to coral single, 'Marmalade'- a double orange beauty, 'Phoenix' - a single yellow with orange tones, 'Pow Wow Wildberry' and 'Pow Wow White' - 2 new dwarf singles with fantastic habits and loads of blooms, 'Snowcone' - A white counterpart to 'Pixie Meadowbrite', 'Secret Pride' - a new double white, 'Secret Joy' - a very soft double yellow, 'Secret Lust' - a new orange double. Geum is and underused group of plants, with some fantastic new cultivars coming out. 'Totally Tangerine' is a great tangerine-orange beauty to 30" tall. This one is incredibly floriferous as well. 'Alabama Slammer' is an orange and yellow blend to 14" tall. I saw Helleborus 'Pink Frost' at some winter trade shows and was blown away by the clarity of color, upward facing flowers, and fantastic foliage. This one is a MUST for the shade garden. We have a ton of other new varieties as well. Be sure to stop in and check them out this spring! I'll try to add pictures to this post as I get them. Hmmmm...I'll have to look into those Yarrow...I love their form...but, yeah, they left a lot to be desired in the past.